Rapidly increasing internet traffic creates an insatiable demand for wireless data bandwidth. This has driven both silicon and III-V semiconductor vendors to explore the millimeter-wave frequency bands (typically defined as 30 to 300 GHz). To support these demands, semiconductors must be characterized at frequencies up to 500 GHz; however, this represents challenges for semiconductor manufacturers as they must simultaneously extend their process development and production capabilities, while continuing to deliver on existing commitments. As IC frequencies increase, design gets more challenging and modeling plays a critical role in ensuring that new processes meet specifications. Accurate models are based on accurate measurements. Accurate wafer-level measurements form the foundation of both process and model development. 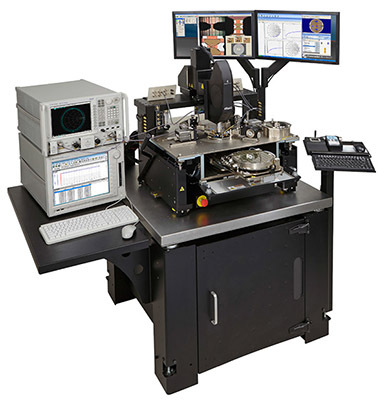 Wafer-level device characterization is a highly challenging, yet necessary task for today's semiconductor test engineers. Accurate and repeatable characterization is essential for device modeling, technology development, process development and specification, process monitoring, component specification, and pilot manufacturing. Achieving the much needed accuracy and repeatability can be difficult, but so too is having to specify and configure the wafer-level measurement system. The entire process can be time consuming, requiring test engineers to source equipment from multiple suppliers. Once on site, all of the measurement equipment, wafer probers and other critical components—each with its own firmware or software control—has to be configured and integrated to ensure data correlation and measurement accuracy between different locations. Then, the integrated measurement system has to be verified. It can easily take weeks, or even months, before the first device measurement takes place. As an example of the difficulty associated with configuration and assembly, consider that over 25-30 cables must be properly configured and assembled in a typical semi-automated wafer-level measurement solution supporting millimeter measurements. A semiconductor test engineer may spend several months of time evaluating, ordering, assembling, and verifying a system. As with any complex system, the engineer is likely to miss a cable, connector or mechanical component, further delaying commissioning of the system. Compounding matters, semiconductor research, modeling and characterization tasks are all evolving, meaning that the test system also has to evolve to be able to support those tasks (Figure 1). Moreover, time-to-market cycles are shrinking and the need for even greater accuracy continues to increase. All of these challenges leave today's semiconductor manufacturing test engineers in need of an integrated solution that can accurately and quickly perform advanced DC and RF measurements on both components and devices—one that offers the performance they need and will work as they expect without them having to invest significant time configuring and verifying it on site. 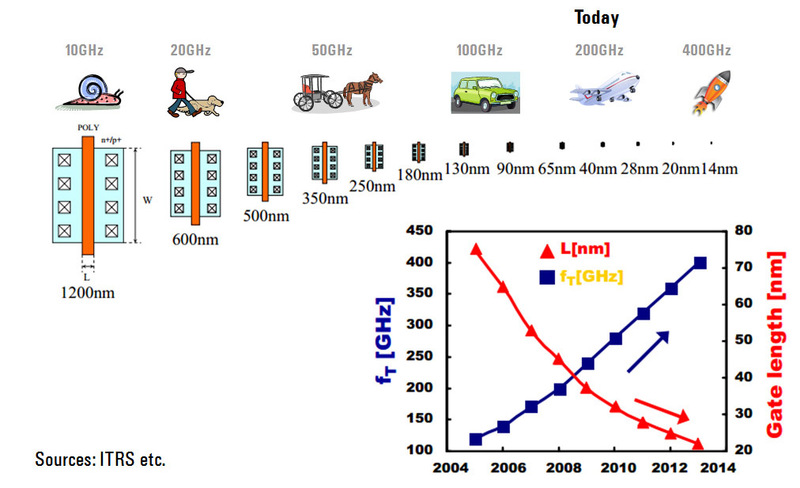 Figure 1: The size of semiconductors is becoming smaller and smaller, resulting in higher and higher cutoff frequencies. Complete characterization of the most recent semiconductors requires measurements in almost the THz range..
One way to eliminate the challenges associated with sourcing, configuring and verifying equipment for wafer-level device characterization from multiple sources is by purchasing a fully integrated and configured RF, DC and Flicker noise measurement solution with guaranteed configuration, installation and support. That's exactly the type of solution Keysight Technologies and Cascade Microtech set out to provide when they entered into a strategic alliance to streamline wafer-level semiconductor measurements. Their efforts resulted in a number of integrated solutions that combine Keysight's test instrumentation and measurement and analysis software with Cascade Microtech's wafer probe stations, probes and calibration tools. The joint Keysight and Cascade Microtech solutions come in a range of configurations; from a fully integrated new solution with either a semi-automated or manual prober, to application-specific hardware upgrades to existing probe stations. Keysight's new WaferPro-XP measurement software platform for R&D device characterization can also be added to an existing wafer-level measurement solution. RF, DC and Flicker noise characterization is supported. The WaferPro-XP platform is the result of a collaboration between Keysight and Cascade Microtech to deliver unique workflow solutions software based on Keysight's WaferPro-XP measurement software. When combined with Cascade Microtech's Velox probe station software, the platform allows engineers to develop complete wafer test suites for varieties of measurement needs (e.g., S-parameters, DC-IV/CV, Flicker noise, gain compression, and other nonlinear characteristics). A typical configuration of an Keysight and Cascade Microtech wafer-level device modeling and characterization solution includes an Keysight PNA Series microwave network analyzer, B1500A semiconductor device parameter analyzer, and Wafer-Pro XP measurement software platform, along with a Cascade Microtech Summit or Elite semi-automated wafer prober for up to 300-mm wafers. The Wafer-Pro XP interface and workflow enables engineers to set up and execute automated wafer-level measurements rapidly. Keysight's IC-CAP software can be added to the Wafer-Pro software bundle to provide engineers a single platform for both measurement and modeling. Using a wafer-level measurement solution like this from Keysight and Cascade Microtech, semiconductor test engineers can now perform wafer-level measurements, device characterization and modeling on devices at frequencies up to 110 GHz with high accuracy and repeatability. And, since the solutions are integrated, they represent a significant overall time savings for engineers used to sourcing and configuring equipment from multiple vendors, as well as a shorter time to first measurement. The unified and uniquely differentiated wafer-level device modeling and characterization solutions from Keysight and Cascade Microtech are available through a formal alliance between the two companies. This represents a new model for the delivery of wafer-level measurement solutions that provides semiconductor customers with a guaranteed configuration, guaranteed installation and guaranteed support (Figure 2). Figure 2. Shown here is a DC and RF device modeling solution with guaranteed configuration, guaranteed installation and guaranteed support. Test engineers get fast, accurate, verified wafer-level semiconductor measurement solutions that ensure measurement performance and correlation between multiple locations, and minimize the time to first tmeasurement. Based on consultation from both Cascade Microtech and Keysight, a wafer-level measurement solution is specifically configured to meet the customer's application needs. This then becomes the basis for the equipment purchase order. The pre-validated solution eliminates the customer's need to outlay capital upfront and spend significant time on the solution configuration. Guaranteed configuration means that any parts that are missing from the configured solution, based on the statement of work, are provided by either Keysight or Cascade Microtech, free of charge. Once delivered and installed on-site by a Cascade Microtech solutions expert, the solution configuration is validated yet again based on previously agreed upon acceptance criteria—guaranteeing the fastest time to start using the solution. Cascade Microtech solutions experts also train all users on how to use the solution, furthering speeding measurement. New validation techniques, jointly developed by Keysight and Cascade Microtech increase confidence that the system is working as specified. This is especially important for critical high precision DC measurements and high frequency microwave measurements. Each wafer-level measurement solution is backed by the offer of a full support package with access to regional solutions experts who are highly skilled in wafer-level test and measurement and available to address any customer questions or issues. Cascade Microtech acts at the single point of contact to ensure a quicker time-to-problem and has direct access to Keysight's field and factory experts to expedite problem solving resolution. Both Keysight and Cascade Microtech offer consulting services on a wide range of topics, such as today's high frequency CMOS ICs, which require precise DC and Flicker noise measurements. For test engineers tasked with performing wafer-level DC, flicker noise and RF semiconductor measurements, the need for accurate, repeatable and fast device characterization has never been more critical. With the guaranteed configuration, installation and support offered with these unique wafer-level measurement solutions, semiconductor test engineers now get fast, accurate, verified performance at the probe tip, minimizing the time to first measurement and ensuring measurement correlation between multiple locations. At the end of the day, that means increased confidence in measurement accuracy and a faster time-to-market for products; both of which are critical to success in today's highly competitive market. For more information on the new Keysight and Cascade Microtech wafer-level measurement solutions, go to www.keysight.com/find/wms and www.cascademicrotech.com/measureone.